Situated on the foreshore of Port Phillip Bay, the Sandringham Yacht Club is Melbourne’s premier sailing club, presenting worldclass sporting and event facilities right on the water’s edge. Alongside the 356-berth floating marina and boat yard,the modern Clubhouse encompasses a wide range of facilities including an a-la-carte restaurant, members’ lounge and bar, café, meeting rooms, an auditorium, offices, and communications room. It is a sought-after venue for weddings and events. Sitting on the coast, the Club’s HVAC and mechanical systems and equipment are prone to corrosion and regular maintenance is fundamental to ensuring systems remain functional and last. A.G. Coombs has been delivering HVAC and mechanical maintenance services to SYC for almost 20 years. The A.G. Coombs team maintains everything from the Clubhouse’s HVAC systems, central energy plant, mechanical switchboards, and specialist kitchen exhausts through to the more straightforward split system air conditioners in the nearby Concessions Building, home to several marine-related retailers. switching systems as part of the new Clubhouse project, and significant water management and reuse systems and waste management and recycling systems. Primary air conditioning for the Clubhouse is provided by an energy efficient Mitsubishi VRF (Variable Refrigerant Flow) system. This system modulates the flow of refrigerant depending upon the heating or cooling requirements of the building. The technology has been optimised by the A.G. Coombs team with the assistance of Mitsubishi experts. In February 2016, it was literally all hands on deck when A.G. Coombs participated in the Club’s Mercedes-Benz Brighton Port Phillip Challenge. 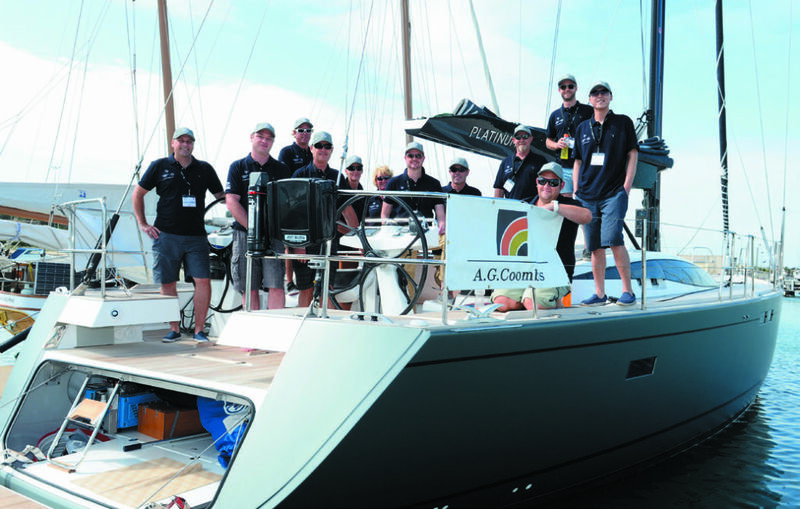 A.G. Coombs staff and guests joined 200 participants and crew on a fleet of 22 of Sandringham Yacht Club’s finest keelboats. The sailing waters of Port Phillip provided reliable and consistent winds ensuring that the fleet had an enjoyable sail around the fixed marked course in pursuit format. The A.G. Coombs team didn’t place, but were pleased to be able to support the Club, with the proceeds from the event assisting with the purchase of a new rescue boat for the Club’s junior and youth sailing program. Year upon year, A.G. Coombs has proven their capability in delivering best-in-class system and asset management and maintenance services. Previous Publication Be Magazine 2016-17 Next Publication Jupiters’ transformation – a sure winner!